The name Ugli is actually a trademark of Cabel Hall Citrus Limited. The company sells its brand of Jamaican tangelos under this name. The fruit has a somewhat ugly appearance because of its wrinkled rind which is greenish or yellow-orange in color. However, it is bigger than a grapefruit and is easy to peel. Ugli fruit is juicy and has a tartly sweet flavor but its segments have a thick, papery skin. You can relish this ugly yet nutritious fruit in fruit salads, green salads, and stir fries. It is usually available for a short time, from late November to April. Ugli fruit is a type of citrus fruit. Hence, it is rich in vitamin C which improves gum health. In fact, a single serving of this fruit (that is half the fruit) provides almost 70% of the recommended daily value of vitamin C in your diet. Vitamin C is essential for collagen formation which in turn promotes gum healing. In addition to this, it prevents and heals issues like bleeding gums and gingivitis. Again, being high in vitamin C, regular consumption of Ugli fruit strengthens your immunity and fights off infections. It has strong antioxidant properties due to flavonoids quercetin and rutin. They fight free radicals and prevent cancer and other chronic diseases. Moreover, this fruit also contains calcium and folic acid. Read more about boosting immunuty in this article on 7 Easy ways To Strengthen Your Immunity. This nutritious fruit lowers the risk of developing cardiovascular disease and stroke. It also helps control your cholesterol and blood sugar levels. It contains pectin which is a soluble fiber that forms a gel-like substance in the intestinal tract which in turn helps trap fats like cholesterol and reduces the buildup of arterial deposits. Furthermore, because of its high vitamin C content, regular intake of Ugli fruit strengthens and helps maintain the elasticity of arteries. Unlike grapefruit, this fruit does not contain compounds that interfere with medications. Thus, people who cannot have grapefruits because it tends to interfere with their blood pressure medications can also have Ugli fruit. Being rich in fiber, ugli fruit is good for your gastrointestinal health. It contains about 2 grams of dietary fiber. Adequate fiber in your diet ensures proper digestion and reduces the chances of developing constipation. In addition to this, it is useful in treating stomach acidity. When combined with an equal amount of lemon juice and a little honey, it helps relive fatigue too. Ugli fruit is believed to be useful in protecting against the formation of kidney stones because it contains citric acid which is considered helpful in preventing certain types of kidney stones. 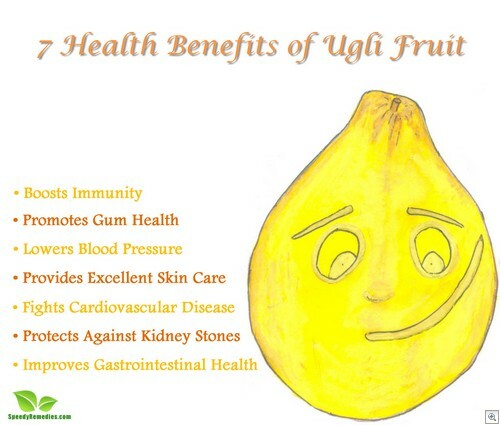 Ugli fruit is a good source of potassium and is low in sodium. Potassium helps regulate blood pressure levels. Furthermore, this fat-free and cholesterol-free fruit is low in calories and has a low glycemic index. Plus, it has anti-allergic properties. Apart from eating this fruit, you can also mash its pulp and add in your homemade skin care recipes. Application of ugli fruit on skin promotes clear skin, free from blemishes. It also helps lighten your complexion. It treats inflammatory skin conditions as well. Tips for purchasing and storing Ugli fruit: Select the fruits that are heavy for their size. Smaller fruits are likely to have a better flavor than the larger ones. Do not buy fruits with bruises or brown spots. You can store the fruit at room temperature for up to five days. When stored in the refrigerator, it shall stay good for a couple of weeks.